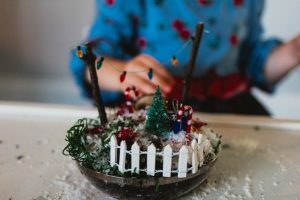 Izzy had an absolute blast creating her Party’n With Plants Winter Fairy Garden and I’m pretty sure your littles will too! Oh and if you are worried you can’t keep a succulent alive, you can chose a fake plant. 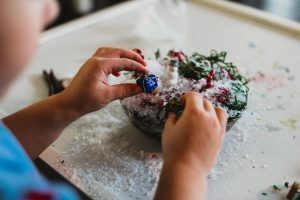 There are so many educational components in this activity and I broke it all down for you. I was super fun & sensory experience. 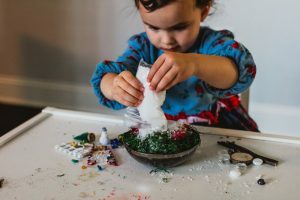 This simple activity will allow you to work on new concepts that can help facilitate developmental growth. I added developmental outcomes below so you can see what areas to scaffold your child in. 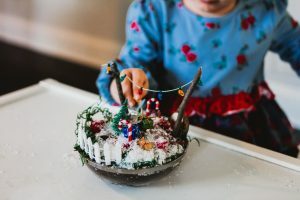 Language: Gaining new positional word vocabulary such as, in/out, before/after & first/next/last & seasonal language such as winter, holiday, festive, candy cane, presents & snow. 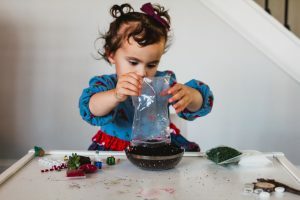 Depending on the child’s age they may also be learning new colors, adjectives, and how to ask questions or explain what they see. Physical: Refining fine motor skills while practicing to open the small bags, pouring them, moving small pieces i.e. the presents, fairy, candy cane etc around on the garden. Language: Gaining new positional word vocabulary and using it appropriately. Positional words: in/out, before/after & first/next/last. 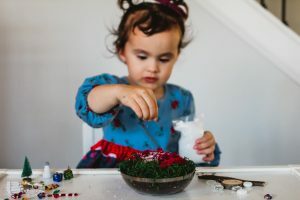 Depending on the child’s age they may also be learning vocabulary for new colors, adjectives, and how to ask questions or explain what they see. Ie. “I put two presents behind the fence.” In that sentence the child is showing they have an understanding for positional vocabulary. Cognitive: Gaining math skills such as counting & sorting. I.e. “I put two presents together” In that sentence the child is showing they can count and sorted, by putting the 2 like objects together. Most importantly I hope you guys had/have fun with this. That is the cutest little craft to do with them! 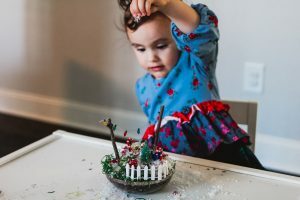 I really love this activity, I need to get one for my girl! This looks like so much fun Eryka and addresses so many educational components as well! !